At the Stampin' Up! Convention last month, there were a lot of boards set up with cards that were designed using new stamp sets and tools that are coming out September 1st. This is one of the cards that was up on the board and it's my version of the card, so that means I CASEd it. CASE stands for Copy And Share Everything. That means that those who create love to share, and those who are browsing, love to copy! My card base is Crumb Cake, then the Into the Woods DSP print is framed using Early Espresso card stock. My window is Basic Black cut out using the new Hearth and Home Framelits. I love these things! They and the stamp set Happy Scenes are my favorite bundle from the new catalog! You save 15% by buying the bundles. 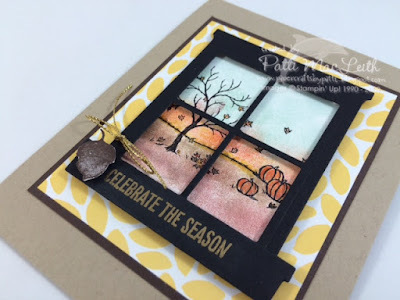 I used my Stampin' Write Markers and my ink pads with blender pens to color the pumpkin Happy Scene. My window is popped up over the scene using Stampin' Dimensionals. 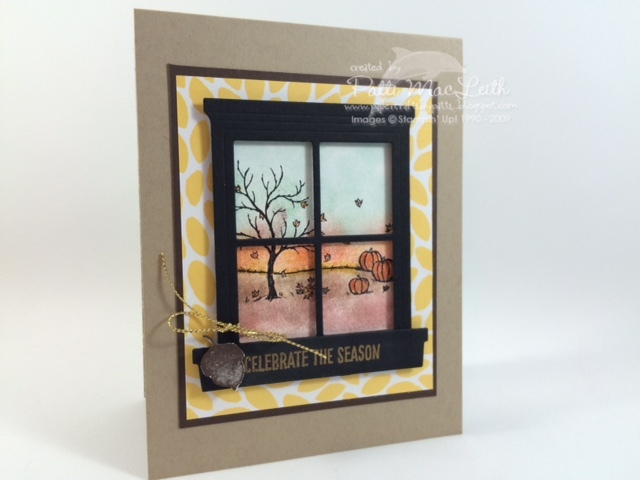 The "celebrate the season" sentiment is stamped using VersaMark and Gold Embossing Powder, which was set using a heat gun. I hope you enjoyed looking and that you will please leave a comment for me below! 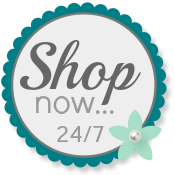 Please use my Online Store for ordering your Stampin' Up! any time! Love your "cased" card! Have a blessed day!